The most common form of benefits theft is for someone to access a Veteran’s eBenefits account and change the bank deposit information. While this isn’t common (there are 7-million active eBenefits accounts), 870 Veterans have been victims of VA benefits theft this year–and most only notice after the funds are late, when the thief has already stolen their money. Safeguarding personally identifiable information (PII) is a Veteran’s best defense against being the victim of identity theft. Veterans should never disclose PII, such as social security number, date of birth, etc., to an unknown third party, and they should regularly change their eBenefits and other account passwords. Additionally, VA employees will never ask you for your account password. If someone says they are from VA and asks for your password, do not give it to them. To help combat identity theft when personal information is changed in eBenefits (such as banking information), VA will send the beneficiary an email to notify him or her that changes were made on the account. 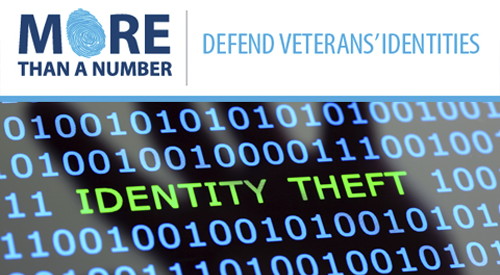 VA takes identity theft allegations and the security of Veterans’ information seriously. When a theft case is reported or suspected, VA investigates the incident and determines what actions are needed to protect the Veteran’s benefits, and then reports those responsible for the alleged theft. To help protect Veterans, VBA has established a specialized incident team as a quick-reaction force to quickly resolve identity theft incidents. The team will work with the beneficiary to correct changes to their account and ensure they receive their reissued benefits quickly. VA has implemented new identity-theft alert protocols for VA Regional Offices and National Call Centers, as well as added a fraud prevention contractor to assist in identifying these illegal activities and patterns before they occur. The team has been successful in tracking down and retrieving funds which were deposited in fraudulent accounts. By working with law enforcement and using proactive and preventative measures, VA has been able to recoup $5,394,377.34 of $5,418,910.77 in misdirected funds since August 2015. Veterans who suspect they have been the victim of identity theft related to their VA benefits should call VA at 1-800-827-1000 as quickly as possible to report an incident. Donna is a public affairs specialist in Veterans Benefits Administration Corporate Communications. She spent most of her career in government public affairs and communications. She recently completed Rating Veterans Service Representative training. Donna is an Air Force Veteran and retired from the Air Force Reserve. Good morning this is 2nd time around the first one was disappear on the screen. I never used yet my Certificate of Eligibility for Loan. I am looking for one to purchase. I am in c/o Elena Dulay, renting this Property (redacted), Auckland NZ 2110. Please be aware of “Frauder” My voters registration and so /my son are on courier already. Thank you. We are the “ORIGINAL” since 1997 we arrive & live here in NZ. My Ebenefits was hacked last month! They changed my direct deposit to a fraudulent account and then changed my email so I wouldn’t be notified. I still haven’t gotten my July benefits and am facing eviction because my rent is 3 weeks late. Finally I spoke to an agent today who, out of at least 10 I’ve spoke to, is getting it expedited. It’s been a nightmare. I am one of the many veterans who have been victimized by these hackers who stole my money. I reported it to the VA and I still haven’t heard from them. It has been over three weeks now and I have no money. Someone please help me!!! !